Bee Balm: Loves shady hillsides and creek banks. Blooms June-July. This one was in the Otter Creek Wilderness Area, MNF, WV. 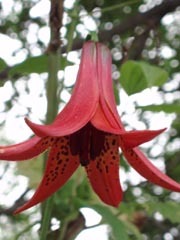 Gray's Lily (Lilium grayii): Deep Red. Petals do not bend back as much as others in this genus. Single flowers up to clusters of 4. Found in the mountains of VA, TN and SC. 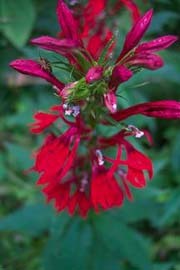 Location: AT - Tar Jacket Rodge, GWNF, VA.
Cardinal Flower (Lobelia cardinalis): Oddly attractive. Grows along streams and in wet areas. Blooms in summer. Location: Long Pond Trail, GRSF, MD. British Soldiers (Cladonia cristatella): This really isn't a flower but a diminutive, colorful lichen usually growing on rocks with other species. This one was seen in Dolly Sods, MNF, WV. 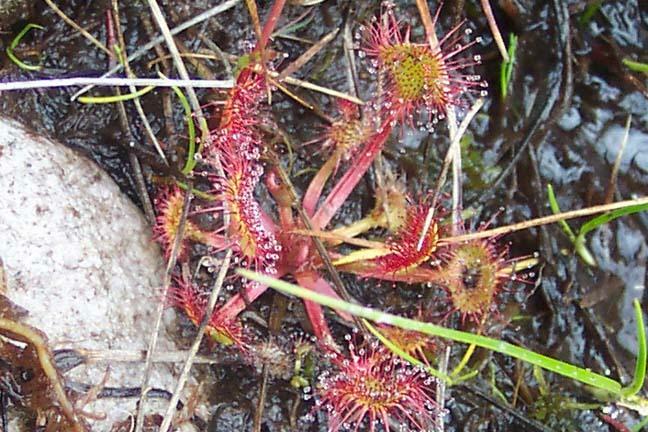 Round-leaved Sundew (Drosera rotundifolia L.): This minute plant (less than 2 inches in height) is carnivourous. Insects get stuck to the apparent drops of dew and are digested in place. It does produce a simple white flower atop a central stalk. Location: All along the wet spots of Dobbin Grade, Dolly Sods North, MNF, WV. 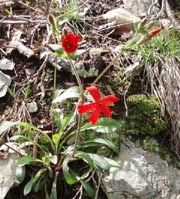 Fire Pink (Silene virginica): Note the double toothed petals. 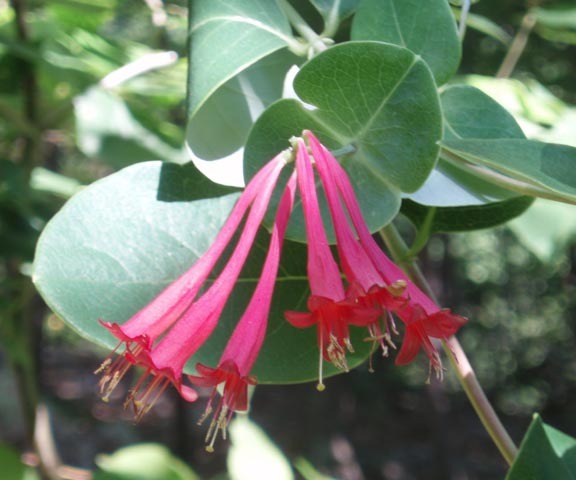 Blooms in open woods and rocky areas April to June. Location: AT, James River Wilderness along the James River cliffs. Trumpet Honeysuckle (Lonicera sempervirens): Brilliant red with yellow stamens. An attractive vine with evergreen tendencies. parallel leaves behind flower clusters fuse to form one. Location: Sugarloaf Mt, MD. Pawpaw ( Asimina triloba): Dark red to maroon flowers, 9 inch eliptical leaves. Tree grows to 20 feet. 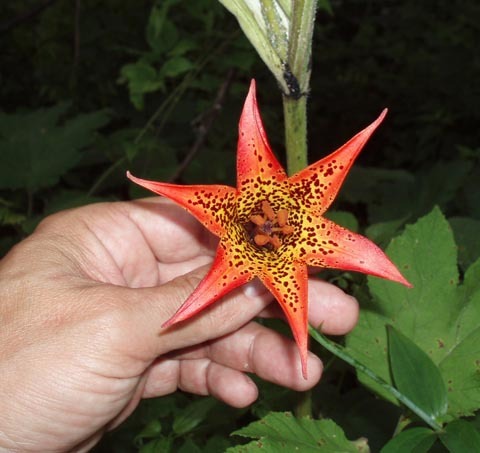 Found in moist forests and flood plains. The fruit is edible. Location: Harpersferry, WV. Photos by Ken Clark. 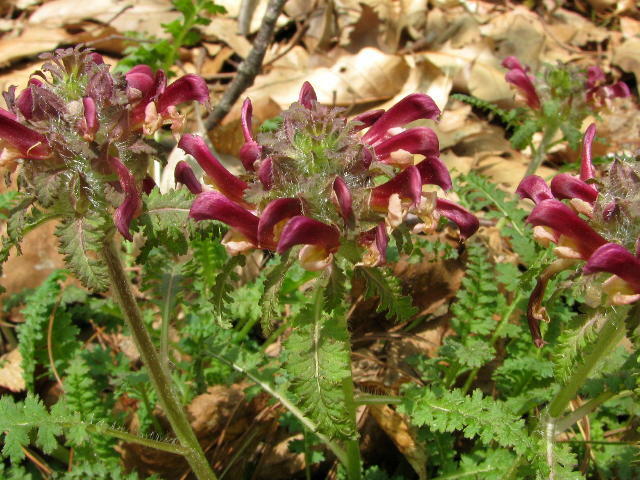 Wood Betony or Lousewort (Pedicularis canadensis): Also found in yellow. In the Snapdragon family. Blooms in early spring. Location: Overall Run area, SNP, VA. Photo by Ken Clark. Red Trillium (Trillium erectum). The first Trillium to bloom in the region. Also known as Stinking Benjamin, Stinking Willie and Wake-Robin. There are pale yellow and white varients as well. Do not confuse these with the White Trillium. Photo by Patrick Roberts. Location: Allegheny Tr, WV. 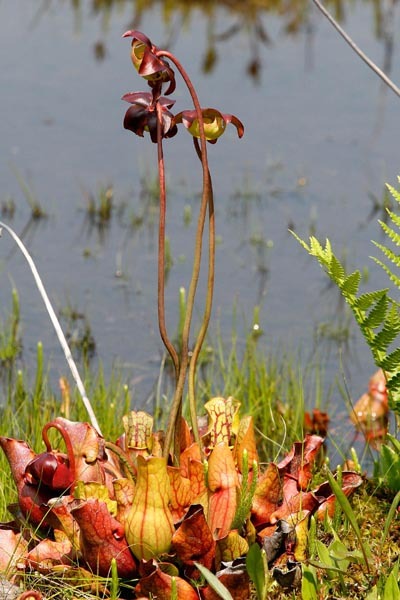 Northern Pitcher Plant (Sarracenia purpurea): Carnivorous! Height 8 to 24 inches. Leaves up to 12 inches. Each plat has a large leathery crimson flower with 5 petals dangling over the basal leaves. Leaves veined deeply red, inflated and in the shape of a pitcher. The flower attracts insects which fall into the "pitchers" which are partially full with water. Inverted hairs on the leaf surface prevent their escape. 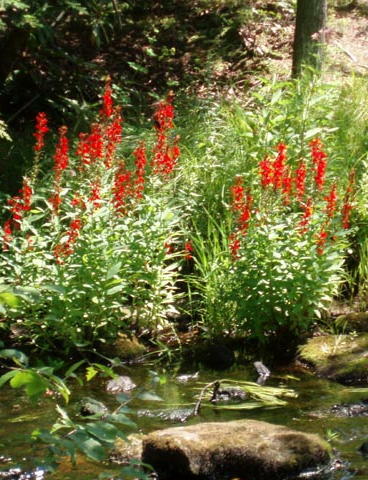 The plant extracts the nutrients from the water as the insect decomposes. Photo by Marc Shaffer.